Tunisian Harissa ! a hot paste produced from fresh chili, garlic and spices, is one of the most famous culinary products. Tunisian Harissa, a recipe inspired for over 60 years, is considered the ultimate Tunisian local product. The popularity of canned Harissa has long since reached the international market, especially Europe. The spicy paste is also a fundamental ingredient of the Tunisian cuisine and can be found in a wide range of dishes. Peppers, Garlic, Salt, Caraway and Coriander. ​Tunisian Harissa contains more than 85 % of fresh red chili pepper. The ‘Tunisia Food Quality Label’ for Harissa was created in 2014. 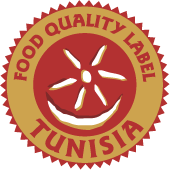 The logo that appears on the certified Tunisian Harissa packages is a guarantee of an authentic traditional recipe and the quality and freshness of its carefuly selected ingredients. Identified by the logo, committed to the label! Companies producing canned Harissa must comply with strict requirements controlled by GICA as an institution managing the Tunisian food quality label & by a certification body. Ps. The Logo of the label, inspired by an ancient coin, represents a smiling sun and invites you to discover the warm Tunisian culinary habits. Double Concentrated tomato puree, Harissa labelled «Food Quality Label Tunisia», Harissa du CAP BON-CAP D’OR, jam, Harissa FNARE DU CAP BON, white beans, chickpeas, peas Fnare, Salad Méchouia, red beans, display units for Harissa 1/6, lentils, white beans in tomato sauce, fruit purée. Carthage Food, has developed since 2004 its expertise in producing high quality products such as HARISSA. The production unit, located on a nine-hectare site uses the most modern manufacturing and packaging technology. With a wealth of achievements and building on its experience, Carthage Food company offers today a wide range of products benefiting from the latest technological innovations in canning and packaging in accordance with ISO 9001, ISO 22000 and the international regulations. Canned tomato : double concentrated tomato puree, triple concentrated tomato puree, canned Harissa Neblia labelled «Food Quality Label Tunisia». La Générale Alimentaire “JOUDA” was founded in 1975 in the middle of an agricutural area linking the city of Kairouan to Oueslatia (central east of la Tunisia). The company is specialized in producing canned food for double and triple concentrated tomato puree (made of fresh tomatoes) and harissa (made of pepper). Certified twice, ISO 9001 and ISO 22000 ( HACCP). In 2008 the company won the Superior taste Award granted by the International Taste & Quality Institute – iTQi. Tomato, Harissa labelled « Food Quality Label Tunisia», Jam, Salad Mechouia, Chakchouka. The Cap Bon Modern Canned–Food Company, COMOCAP was founded in May 1961 by late Ali Obay. 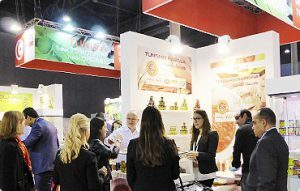 COMOCAP is specialized in producing double concentrated tomato puree and pepper Harissa as well as jam… . All these products are marketed under the same brand name «Le Petit Paris». Since its foundation, our company has been rooted in its natural environment renowned for its high quality and for the taste of farm products. COMOCAP has been growing throughout the years and succeeded to assert its brand image based on high quality and professionalism. The high level of food safety is also a sound guarantee through the ongoing updating of the control systems and their full compliance with the most rigorous quality standards ISO 9001/ISO 22 000 et OHSAS 18001. Société Tunisienne Industrielle du Cap Bon was founded in 1974. It is specialized in processing fresh fruit and vegetables “Olives, Tomatoes, peppers, strawberries, apricots, apple, quince, figs, pears,…” into canned food without preservatives, additives or dyes in order to provide its customers with high nutritional quality food in line with international standards. This is the first Tunisian canning factory having won two international certifications: HACCP DS 3027 V 2002 and ISO 9001 V 2000. PACNA is a subsidiary of SODACO Group (Daoud Canned Food Company) created in 1969. Located in the Cap Bon area, PACNA is one of the leading companies in the agrofood sector in Tunisia. Our concern is to constantly improve the quality of our products and to diversify our range according to the expectations and needs of our customers. Canned tomato and tomato sauce, Harissa, and Harissa certified «Food Quality Label Tunisia», Salad mechouia, Quince jam. “Zgolli Frères is a family company, created in 1975 specialized in fruit and vegetables processing. The factory is located in the Cap Bon area in the northeastern of Tunisia, close to tomatoes and peppers fields. Our wide range of products is the result of a constant work of innovation combining development and improved cooperation between our customers, our suppliers and our team. 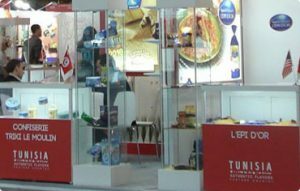 Established in 1965, the Tunisian Group for the Canned Food Industries (GICA) is a public institution gathering the Tunisian industries involved in fruit, vegetable & fish processing sectors, under the authority of the Ministry of Industry. The establishment and improvement of specifications. Monitoring of the certified products and the right to use of the logo. Performing chemical, physical and stability tests in its accredited laboratory. The Project on market access for agrofood and typical products in Tunisia (French acronym PAMPAT Tunisia) aims at improving the performance, market access and socio-economic conditions of producers in three selected value chains around traditional, regional flagship products, namely Harissa, fig of Djebba and the cactus/prickly pear in Kasserine. PAMPAT is being implemented by the United Nations Industrial Development Organization (UNIDO) in collaboration with the Tunisian Ministries of Industry and Agriculture. The project is financed by the Swiss State Secretariat for Economic Affairs (SECO). The project focuses on strengthening the governance of the selected value chains, improving the productivity and promoting product diversification of the micro, small and medium enterprises involved. The project also aims at enhancing the positioning of the three supported regional flagship products in both domestic and export markets through a collective approach. Additionally, the PAMPAT project promotes the products’ compliance with the requirements of the Tunisian quality labels and geographical indications in order to position the agrofood products in niche markets thus increasing the revenues and employment opportunities in the three value chains. Special attention is being placed in supporting young entrepreneurs, women and those producers located in disadvantaged regions. Regarding the harissa value chain, the PAMPAT project has assisted the Ministry of Industry and the public-private Tunisian Group for Canned Food Products (GICA) to set-up the certification and control system of the voluntary labelling standard “Food Quality Label Tunisia”. Industrial companies interested in certifying their harissa production need to apply stringent product specifications and undergo a double check, both from the managing body of the label GICA and an external certification institute. The project has also provided technical assistance to nine harissa companies to set-up the required traceability system along the supply chain and comply with the product specifications. The latter were published in December 2014 by decision of the Minister of Industry. Today five companies have started producing certified “Food Quality Label” harissa. It is expected that 4 additional companies will follow at the end of 2016. With the support of the PAMPAT project and GICA, the five companies SICAM, JOUDA, COMOCAP, CARTHAGE FOOD and STICAP, which account for one third of total industrial harissa production in Tunisia, have already started promoting together their certified harissa. The new label is being presented in several countries such as Italy, Switzerland, Germany, Spain and USA.